Discover the 10 bright and warm colours of Purobio Organic Lipsticks! Semi-matt finish, your mouth is embellished and bright. 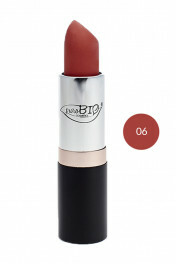 Very comfortable to wear, your lips are moisturized and soft all day long thanks to organic castor oil. Very easy to apply, a single pass is enough to cover your lips thanks to the high pigmentation. Ready for a glamorous mouth with Purobio Organic Lipstick! Bien reçu mes produits toujours parfaitement emballé avec un gentil message. 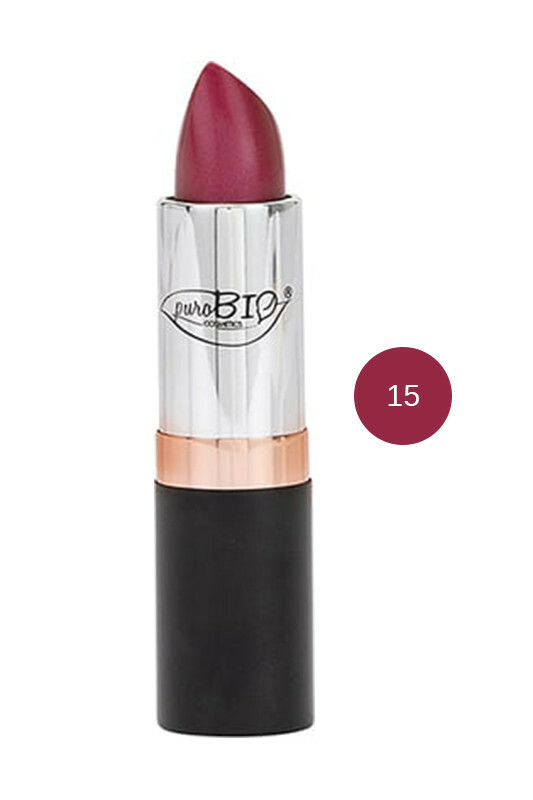 Pour la couleur pêche clair la texture reste un peu sèche et j'aurai préféré plus fluide quant au rose sable il est agréable à l'application et plus brillant . S il y avait des couleurs irisées ce serait bien ! PUROBIO Semi-Mat Lipstick makes your lips beautiful! 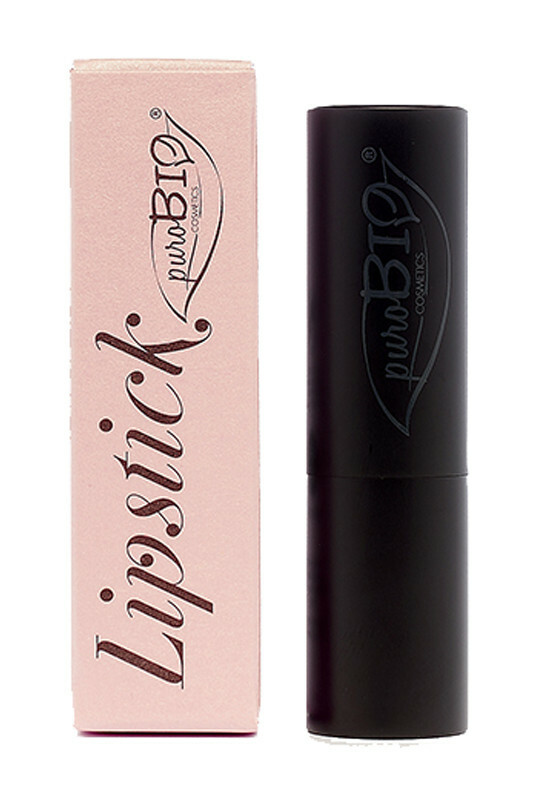 To make your lipstick or lipgloss last longer, start by taking a PUROBIO Organic Lip Pencil in the same colour to line your lip contour and fill on the inside. Now you can apply your lipstick over it with Purobio Lip Brush. Note: all Purobio lipsticks are semi-matt, the iridescent effect is due to the sun. 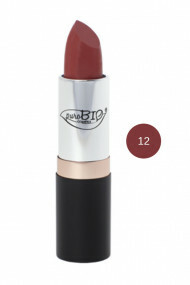 Which lipsticks should I use with my Purobio lip pencils? 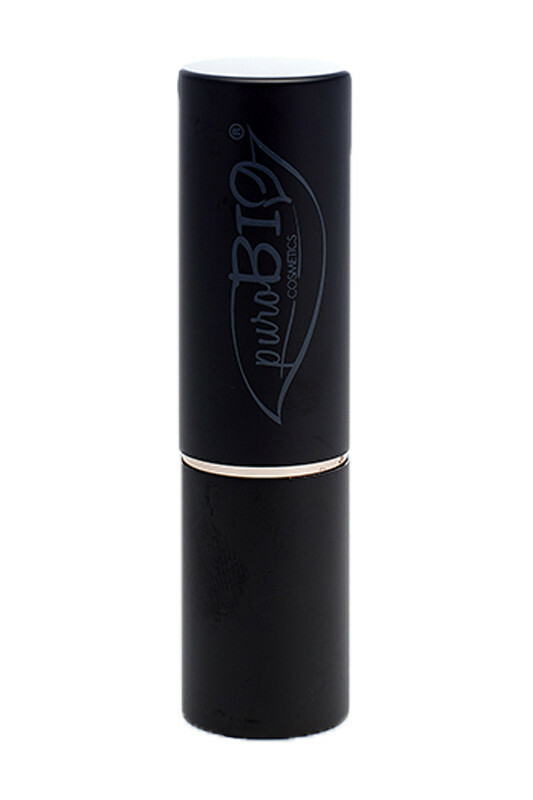 Purobio Lipsticks are gentle on your lips! INCI 01 : RICINUS COMMUNIS (BEAVER) SEED OIL*, HYDROGENATED CASTOR OIL DIMER DILINOLEATE, COCONUT ALKANES, CI 77891 (TITANIUM DIOXIDE), C10-18 TRIGLYCERIDES, CI 77007 (ULTRAMARINES), EUPHORBIA CERIFERA (CANDELILLA) WAX, STEARYL BEHENATE, MICA, CI 77491 (IRON OXIDES), POLYGLYCERYL-3 DIISOSTEARATE, CI 77492 (IRON OXIDES), COCO-CAPRYLATE/CAPRATE, CI 77742 (MANGANESE VIOLET), GLYCERYL ROSINATE, PERFUME (FRAGRANCE), TOCOPHEROL, CI 77499 (IRON OXIDES). INCI 02 : RICINUS COMMUNIS (BEAVER) SEED OIL*, HYDROGENATED BEOR OIL DIMER DILINOLEATE, COCONUT ALKANES, EUPHORBIA CERIFERA (CANDELILLA) WAX, C10-18 TRIGLYCERIDES, CI 77742 (MANGANESE VIOLET), MICA, STEARYL BEHENATE, CI 77891 (TITANIUM DIOXIDE), POLYGLYCERYL-3 DIISOSTEARATE, COCO-CAPRYLATE/CAPRATE, CI 77007 (ULTRAMARINES), CI 77491 (IRON OXIDES), GLYCERYL ROSINATE, PERFUME (FRAGRANCE), TOCOPHEROL. INCI 03 : RICINUS COMMUNIS (BEAVER) SEED OIL*, HYDROGENATED CASTOR OIL DIMER DILINOLEATE, COCONUT ALKANES, MICA, CI 77891 (TITANIUM DIOXIDE), C10-18 TRIGLYCERIDES, CI 77007 (ULTRAMARINES), EUPHORBIA CERIFERA (CANDELILLA) WAX, STEARYL BEHENATE, CI 75470 (CARMINE), POLYGLYCERYL-3 DIISOSTEARATE, COCO-CAPRYLATE/CAPRATE, GLYCERYL ROSINATE, PERFUME (FRAGRANCE), TOCOPHEROL, CI 77491 (IRON OXIDES). INCO 04 : RICINUS COMMUNIS (BEAVER) SEED OIL*, HYDROGENATED CASTOR OIL DIMER DILINOLEATE, CI 75470 (CARMINE), COCONUT ALKANES, C10-18 TRIGLYCERIDES, MICA, CI 77891 (TITANIUM DIOXIDE), EUPHORBIA CERIFERA (CANDELILLA) WAX, STEARYL BEHENATE, POLYGLYCERYL-3 DIISOSTEARATE, COCO-CAPRYLATE/CAPRATE, GLYCERYL ROSINATE, PERFUME (FRAGRANCE), CI 77492 (IRON OXIDES), TOCOPHEROL, CI 77491 (IRON OXIDES). INCI 05 : RICINUS COMMUNIS (BEAVER) SEED OIL*, HYDROGENATED CASTOR OIL DIMER DILINOLEATE, CI 75470 (CARMINE), COCONUT ALKANES, C10-18 TRIGLYCERIDES, EUPHORBIA CERIFERA (CANDELILLA) WAX, CI 77891 (TITANIUM DIOXIDE), STEARYL BEHENATE, MICA, POLYGLYCERYL-3 DIISOSTEARATE, CI 77499 (IRON OXIDES), COCO-CAPRYLATE/CAPRATE, PERFUME (FRAGRANCE), GLYCERYL ROSINATE, TOCOPHEROL. INCI 06 : RICINUS COMMUNIS (BEAVER) SEED OIL*, HYDROGENATED CASTOR OIL DIMER DILINOLEATE, COCONUT ALKANES, CI 77891 (TITANIUM DIOXIDE), CI 77491 (IRON OXIDES), C10-18 TRIGLYCERIDES, EUPHORBIA CERIFERA (CANDELILLA) WAX, MICA, STEARYL BEHENATE, CI 75470 (CARMINE), POLYGLYCERYL-3 DIISOSTEARATE, CI 77742 (PURPLE MANGANESE), COCO-CAPRYLATE/CAPRATE, GLYCERYL ROSINATE, FRAGRANCE, TOCOPHEROL. INCI 07 : RICINUS COMMUNIS (BEAVER) SEED OIL*, HYDROGENATED CASTOR OIL DIMER DILINOLEATE, COCONUT ALKANES, CI 77891 (TITANIUM DIOXIDE), CI 75470 (CARMINE), C10-18 TRIGLYCERIDES, EUPHORBIA CERIFERA (CANDELILLA) WAX, STEARYL BEHENATE, MICA, CI 77491 (IRON OXIDES), POLYGLYCERYL-3 DIISOSTEARATE, COCO-CAPRYLATE/CAPRATE, PERFUME (FRAGRANCE), GLYCERYL ROSINATE, TOCOPHEROL. INCI 08 : RICINUS COMMUNIS (BEAVER) SEED OIL*, HYDROGENATED CASTOR OIL DIMER DILINOLEATE, COCONUT ALKANES, CI 75470 (CARMIN), C10-18 TRIGLYCERIDES, EUPHORBIA CERIFERA (CANDELILLA) WAX, CI 77491 (IRON OXIDES), STEARYL BEHENATE, MICA, POLYGLYCERYL-3 DIISOSTEARATE, CI 77891 (TITANIUM DIOXIDE), CI 77499 (IRON OXIDES), CI 77492 (IRON OXIDES), COCO-CAPRYLATE/CAPRATE, GLYCERYL ROSINATE, PERFUME (FRAGRANCE), TOCOPHEROL. CI 75470 (CARMINE), MICA, CI 77492 (IRON OXIDES), POLYGLYCERYL-3 DIISOSTEARATE, COCO-CAPRYLATE/CAPRATE, PERFUME (FRAGRANCE) GLYCERYL ROSINATE, TOCOPHEROL. 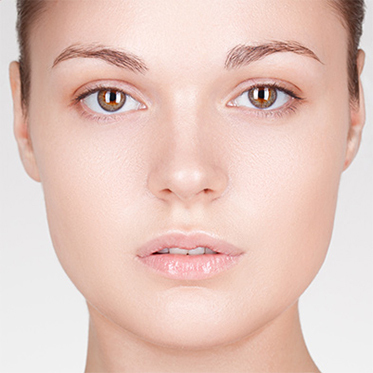 INCI 10 : RICINUS COMMUNIS (BEAVER) SEED OIL*, HYDROGENATED BEAVER OIL DIMER DILINOLEATE, CI 77891 (TITANIUM DIOXIDE), COCONUT ALKANES, C10-18 TRIGLYCERIDES, EUPHORBIA CERIFERA (CANDELILLA) WAX, STEARYL BEHENATE. CI 75470 (CARMINE), MICA, POLYGLYCERYL-3 DIISOSTEARATE, COCO-CAPRYLATE/CAPRATE, PERFUME (FRAGRANCE), GLYCERYL ROSINATE, TOCOPHEROL. INCI 11 : Ricinus Communis (Castor) Seed Oil*,Hydrogenated Castor Oil Dimer Dilinoleate, Coconut Alkanes, Ci 75470, Euphorbia Cerifera (Candelilla) Wax, C 10-18 Triglycerides, Stearyl Behenate, MicaCi 77891 (Titanium Dioxide), Polyglyceryl-3 Diisostearate, Coco Caprylate/ Caprate, Parfum (Fragrance), Glyceryl Rosinate, TocopherolCi 77491 (Iron Oxide). 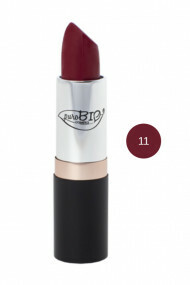 INCI 12 : Ricinus Communis (Castor) Seed Oil*, Hydrogenated Castor Oil Dimer Dilinoleate, Coconut Alkanes, Euphorbia Cerifera (Candelilla) Wax, C 10-18 Triglycerides, Ci 77891 (Titanium Dioxide), Mica, Stearyl Behenate, Ci 77491 (Iron Oxide), Polyglyceryl-3 Diisostearate, Coco Caprylate/ Caprate, Parfum (Fragrance), Glyceryl Rosinate, Ci 75470, Tocopherol. INCI 13 : Ricinus Communis (Castor) Seed Oil*, Hydrogenated Castor Oil Dimer Dilinoleate, Mica, Euphorbia Cerifera Cera (Candelilla Wax), Coconut Alkanes, Ci 77891 (Titanium Dioxide), C 10-18 Triglycerides, Stearyl Behenate, Ci 77491 (Iron Oxide), Ci 75470, Polyglyceryl-3 Diisostearate, Glyceryl Rosinate, Parfum (Fragrance), Ci 77499 (Iron Oxide), Coco Caprylate/ Caprate, Tocopherol. INCI 14 : Ricinus Communis (Castor) Seed Oil*, Hydrogenated Castor Oil Dimer Dilinoleate, Mica, Euphorbia Cerifera Cera (Candelilla Wax), Coconut Alkanes, Ci 77891 (Titanium Dioxide), C 10-18 Triglycerides, Stearyl Behenate, Ci 77491 (Iron Oxide), Ci 75470, Polyglyceryl-3 Diisostearate, Glyceryl Rosinate, Parfum (Fragrance), Ci 77499 (Iron Oxide), Coco Caprylate/ Caprate, Tocopherol. INCI 15 : Ricinus Communis (Castor) Seed Oil*, Hydrogenated Castor Oil Dimer Dilinoleate, Mica, Euphorbia Cerifera Cera (Candelilla Wax), Coconut Alkanes, Ci 77891 (Titanium Dioxide), C 10-18 Triglycerides, Stearyl Behenate, Ci 77491 (Iron Oxide), Ci 75470, Polyglyceryl-3 Diisostearate, Glyceryl Rosinate, Parfum (Fragrance), Ci 77499 (Iron Oxide), Coco Caprylate/ Caprate, Tocopherol. Un peu trop crémeux ou gras pour moi, je préfère les RAL plutôt sec et mat qui s'estompe tout doucement comme ceux de Boho dans les mat ( j'adore leur texture et l'odeur), ceci explique mes 3 étoiles pour ce RAL Purobio même si la couleur N°02 sable rosé, teinte discrète, est jolie en journée au quotidien, je n'ai pas aimé ce RAL mais ce n'est que mon avis.